EDIT: Giveaway is officially over. Congratulations to Nouran Ahmed for submitting the randomly-chosen 855th entry. I've heard snow is glistening in other states already. Have you built a snowman and pretended he was Parson Brown yet? 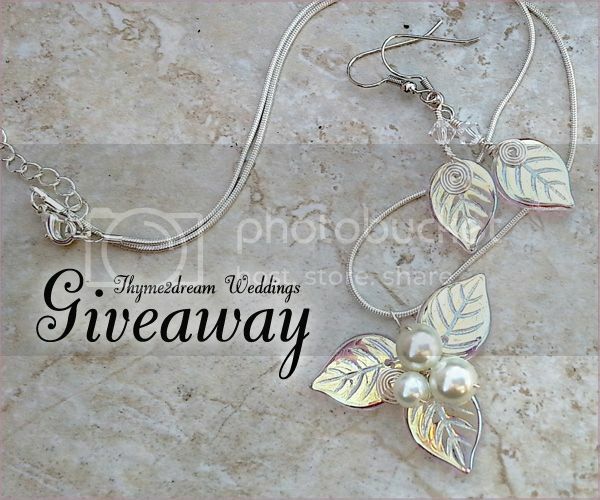 Married or not, you could win a winter woodland jewelry prize package by Karla of Thyme2dream Weddings. Her icy leaf necklace and earring set is a beautiful sight. Both are adorned with sparkling Swarovski crystals and choice of gold or white pearls. The whimsical design is available in silver or gold wire, both of which are nickel-free with non-tarnish coat to keep it shiny for wearers with sensitive skin. Exploring Karla's fantasy jewelry shop is cooler than walking in a winter wonderland. As you go along, princess tiaras, mermaid hair combs and elven ear cuffs are just a few of the fairytale creations you'll encounter. And if that wasn't enough to make you happy tonight - she's offering free worldwide shipping through December 18, 2013, just use coupon code "T2DFREESHIP13" during checkout. Use the Rafflecopter below to enter to win worldwide giveaway before 11:59pm EST on December 30, 2013. Be sure to leave the mandatory comment on the blog post with the same name you use to fill out the Rafflecopter - all entries by winner must be easily verified or a new winner will be chosen. I adore the Fields of Gold Fairy Torc Necklace! Really loving the Ear Cuff Lothlorien Crystal Elven Forest! I love the celtic headbands. Beautiful! I adore the headbands, but i chose an earcuff. I love all of her work! It is so difficult to pick one thing. I love her tiara's the best and guess I have to pick The fields of gold flame tiara if I have to pick just one. Oh dear so hard to pick! Winter Woodland set gets my top pick because it is so lovely and would go with anything I might wear! A close second is the Fields of Gold set, I love those colors! I ordered Karla's Fairy Lights Magic Forest Princess Tiara Circlet along with the matching bracelet and an ear cuff she specially made to match. Her jewelry is pure magic! I have always loved the elegant style of the Sapphire and Ice Elven Ear Cuff. I love the ear cuffs, especially the Garnet Red and Gold Ear Cuff Earring Bajoran Style. Love the winter wonderland set! I love the Necklace Red Fairy Wedding Collection. The elven headdress looks so exotic! Love the Fields of Gold Crystal Drop Earrings! These pretty ear cuffs. I just love these! Love the Lady of Rohan Eowyn headrests!! I love the leaf necklace and earrings! I love the Emerald Green Woodland Fairy Rainbows Bracelet, I hadn't seen any of her bracelets before and it is absolutely gorgeous! I would love the Sapphire and Ice Earrings! fields of gold necklace is stunning! Love the Aqua and Purple Ear Cuff Vine! I like Pearl Of The Sea Ear Cuff. Oh! I think it is all so beautiful! One thing I liked was the Queen Mab's Fairytale Wedding Tiara! My favorite item is actually the Winter Woodland Set from the giveaway! What a lucky coincidence! https://www.etsy.com/listing/92186407/fairytale-heart-wedding-necklace?ref=shop_home_active it is very nice i like it so much! I really like the Amethyst Myst Wrist Corsage Bracelet best. The bracelet and the Fairytale Heart Wedding Necklace are hard to choose between, but my choice came from amethyst being my birthstone and also how I like some color with it. The Elven Wedding Circlet!! I need one for my wedding! Wow they have plenty amazing stuff! My favorite item from the shop is the Fields of Gold Crystal Drop Earrings. My favourite is the Lady of Rohan Eowyn Tiara Circlet Headdress. It is gorgeous! My favorite item is the Celtic Weave Circlet Headband Spring Green Pearl. I really like the Fields of Gold Fairy Torc Necklace. Thanks! I love the Earrings Red Fairy Wedding Collection! The Fields of Gold Crystal Drop earrings are beautiful! Fairytale Heart Wedding Necklace Withywindle Collection nice! Fields of Gold Fairy Torc Necklace is cute! Everything is so pretty. I really like the set in this giveaway. I also like the Amethyst Myst Wrist Corsage Bracelet. Everything is so lovely, and I really like the Fairy Earrings Queen Mab's Wedding. I think my favorite item is the Fields of Gold Crystal Drop Earrings! Ear Cuff Lothlorien Crystal Elven Forest! I liked the Sapphire and ice wedding tiara, very elfin and woodsy. I love the Celtic Renaissance Wedding Headdress! I like the Fields of Gold Art Nouveau Flame Tiara. Fields of Gold Fairy Torc Necklace! I really like the Fields of Gold Necklace & Earring Set! Sapphire and Ice Wedding Tiara,Queen Mab's Fairytale Wedding Tiara,Mermaid Ear Cuff and the giveaway set ... everything is beautiful.Amazing giveaway,so generous of you,thank you for the chance to win it.Happy holidays!!! I love the Rainflower Collection! My favorite is definitely the "Labradorite Rainflower Elven Forest Ring"
I really like the red Necklace from the Red Fairy Wedding Collection. sapphire and ice wedding tiara. Love the Lady of Rohan Tiara! The Fields of Gold Necklace & Earring Set is so wow! I love it. I fell in love with the Pearl of the Sea Ear Cuff! It's so beautiful! I like the Winter Woodland Leaf Necklace Earring . I like the Necklace Red Fairy Wedding Collection. I like the Red Fairy bracelet. I like the Fairytale Heart Wedding Necklace. Love Love Love the custom Elven Wedding Heddress. I like the Lady of Rohan Eowyn headrests. The Sapphire and Ice Earrings is beautiful! A winter wedding crown tiara would be an awesome piece of this beautiful collection to own. As a hair dresser this would be a beautiful wedding present or add on for using. I love the Fairytale Wedding earrings! I like the Celtic Goddess Ear Cuff in Emerald Crystal. Thank you! I like the Art Nouveau Fairy Bower Necklace Moonlit Blue! I love this Celtic Ivy Pearl and Garnet Wedding Tiara Crown Circlet. I love the Swarovski Crystal Ear Cuff!! Its so pretty! Titania's Dream Hair Comb is my fave! The design of all the jewelry has an effect that changes from design to design. I love it all and could never decide on just one. Honestly, I have many many favorites in Karla's truly enchanting shop (see all of the items/creations that have been Etsy "hearted" / favorited by Me, Jesselyn (aka Salleefur) - but one of my most favorite favorites is the stunning: https://www.etsy.com/listing/95007758/titanias-dream-fairytale-hair-vine?ref=shop_home_active ! Thanks for the very generous and wonderful giveaway! I like the Sapphire and Ice Wedding Tiara. My favorite piece is the Labradorite Rainflower Elven Forest Hair clip. I really like the Titania's Dream Woodland Fairy Necklace! I like the Ear Cuff Lothlorien Crystal Elven Forest, very beautiful. I love it all! One of my favorites is the Amethyst Wedding Tiara with purple and violet leaf beads. Soooo pretty!! I love the Ear Cuff Lothlorien Crystal Elven Forest. My favorite is Elven Forest Woodland Headdress. It's so beautiful!